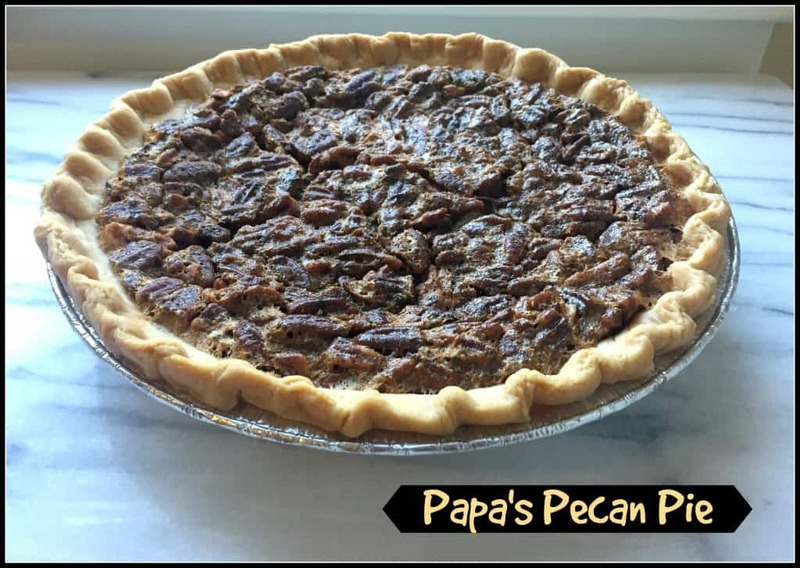 Papa’s Pecan Pie is the only pecan pie recipe you will ever need. My dad makes the best pecan pie. Throughout college, I would bring classmates to my parents’ house for Thanksgiving dinner and weeks later I would still be hearing about the pecan pie. Needless to say, I had to learn how to make it. And, being that I live in North Carolina now, I am even able to get an endless supply of local North Carolina pecans right at my farmers market! Now that my kids are old enough to appreciate pie – they always demand that I make “Papa’s Pecan Pie.” Of course! 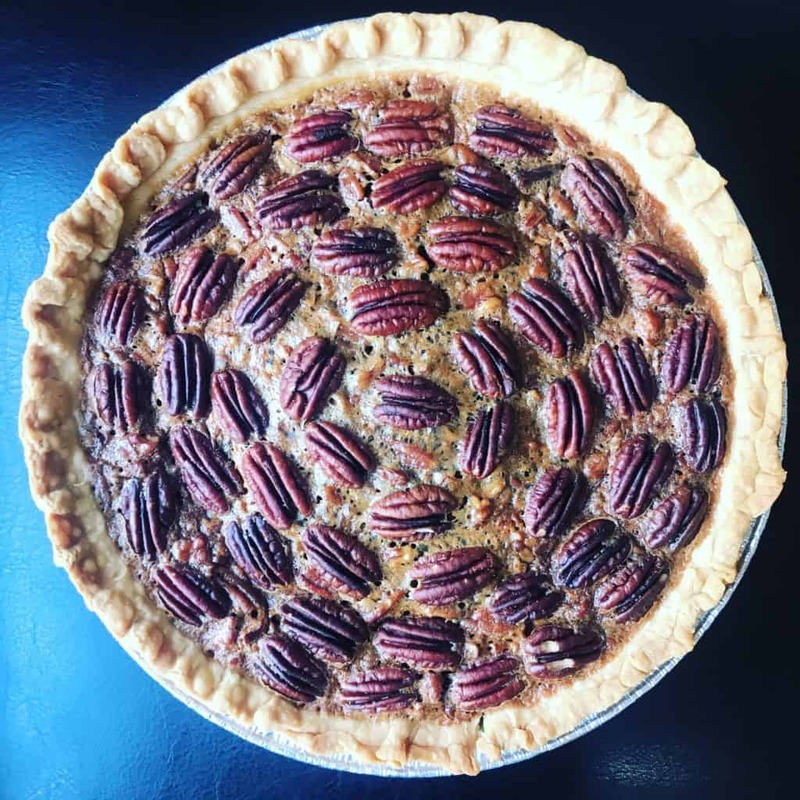 Usually, in the week leading up to Thanksgiving, I make a lot of pies – like 10 or 12 – and usually half of them are pecan pies. I usually keep one pecan pie for myself but I am thinking that I might need to keep 2… one is not enough to share! Leftover pecan pie is amazing with coffee for breakfast. There are a few things to remember when making a pecan pie… First, never, ever use a mixer. Only use a spoon, whisk, or spatula (I like to use a wooden spoon) and please stir gently. Second, it is pretty much impossible to overcook the custard part of the pie but very easy to overcook the crust so plan accordingly. I bought a pie crust ring to solve that problem, but you could also make your own ring of aluminum foil. 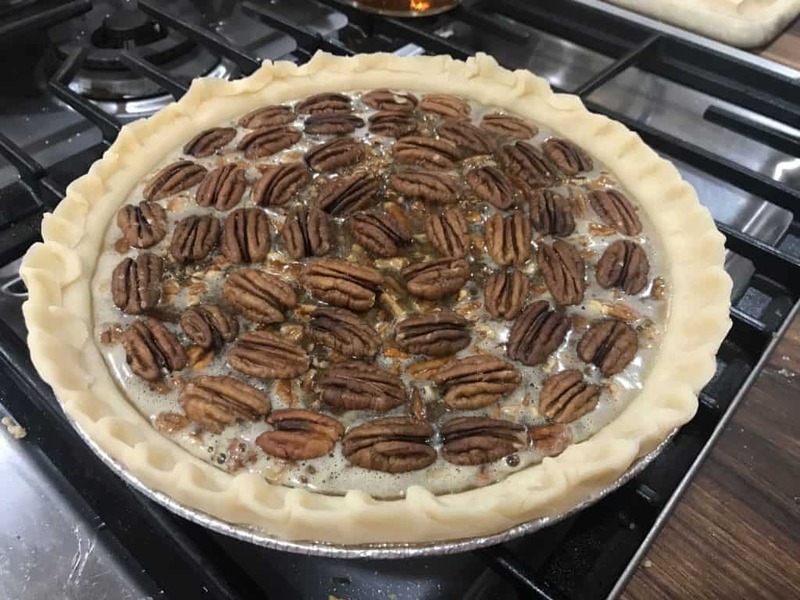 Pretty Pecan Pie Tip: If you want to fancy up your pie, you can use chopped pecans for the bottom layer under the custard and then neatly arrange pecan halves in a circle around the edge – make one circle or two – or cover the entire pie with pecan halves. 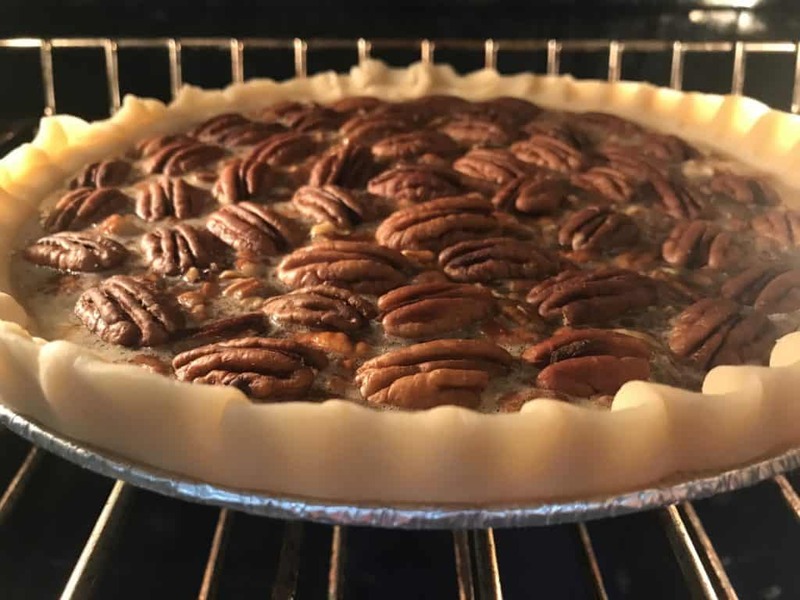 As the pie bakes, the pecan halves do stay neatly on top. 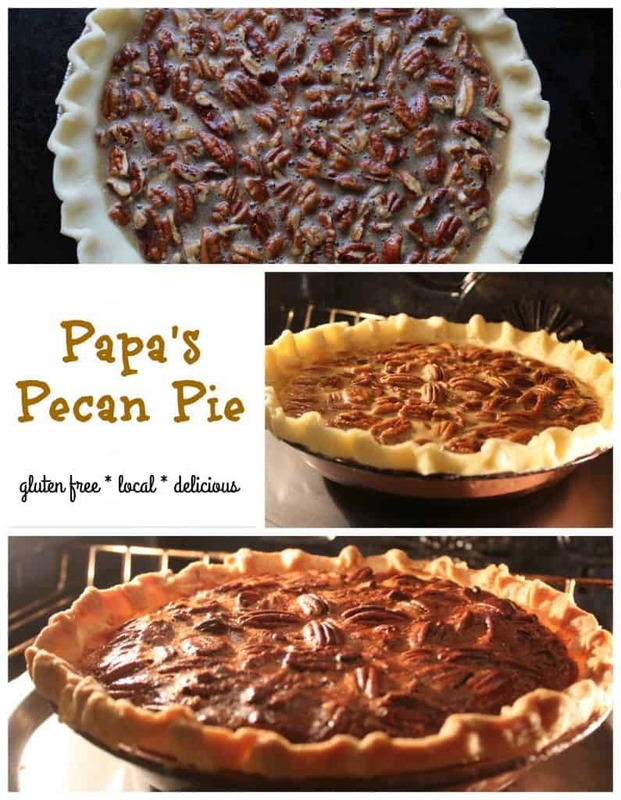 This super simple recipe for Papa's Pecan Pie is the only pecan recipe you will need. Prepare your 9-inch pie crust, put it in your pie plate, and put it back into the fridge. Heat the oven to 350 degrees with a cookie tray in it (preferably on a lower rack) - allow the cookie pan to heat up while the oven heats up. Slightly beat three eggs. Gently whisk in brown sugar, salt, cornstarch, and the melted butter. Add the vanilla and the corn syrup and stir to combine. Put the pecans into the bottom of your pie plate. Pour the filling over the top of the pecans. Put the pie plate onto the hot cookie tray and let the pie cook for about an hour. My dad says to let it cook for 45 to 60 minutes but my pecan pie always takes the full hour. To avoid a burnt pie crust, fold some tin foil around the edges of the pie crust before you put it in (or use a pie ring) and take it off when you only have about 15 minutes to go so the crust can get slightly browned. Pie Crust … If you live near a Whole Foods, you can buy a gluten-free pre-made crust, but making your own gluten-free pie crust isn’t very hard at all!! Gluten-free flour blends have improved so much, your friends will never know. How lovely! I love to see good family recipes get passed down! Looking forward to trying this one out. 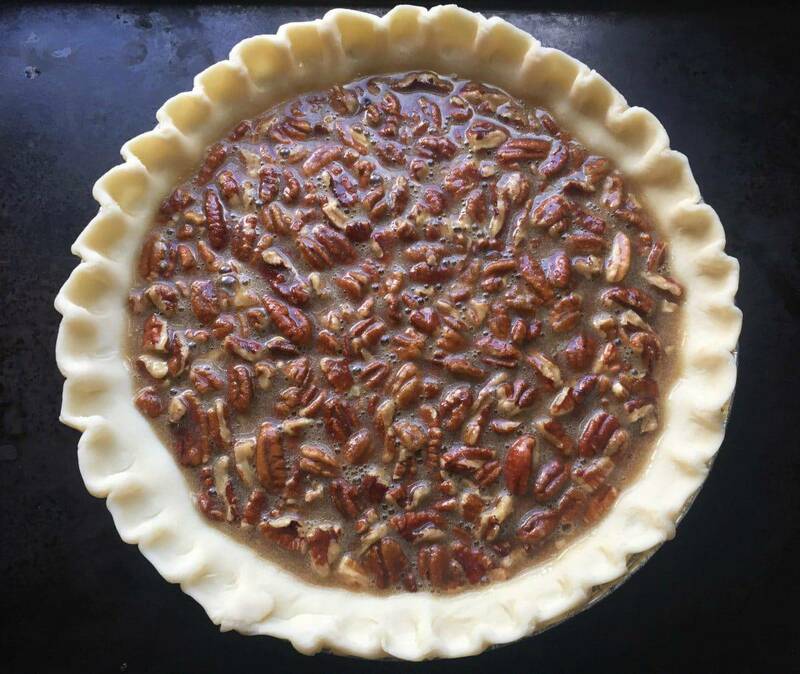 Pecan pie is my absolute favorite of all time, can’t wait to try your version! I admit that for many years growing up, I turned my nose up at the pecan pie that always showed up at family gatherings. What the heck was I thinking? Now I’m fortunate to a) have corrected that oversight, and b) to live in Texas where pecans are abundant. Can’t wait to try this version! You are lucky to have fresh pecans! If you can believe it, we have loads here in the Phoenix area, too! How great to have a family recipe like this, and how great you make enough to give away! I’d love to dig in to this pie this week! Nice! I cannot believe you have fresh pecans in Phoenix! That surprises me! 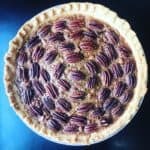 Pecan pie is one of my favorites, and the best part is nobody in my family realizes how easy it is to make! It’s a win win! I have never made a pecan pie! But boy do we love pecans in this house and if your dad says it’s good, then it must be!! Thanks, Beth! 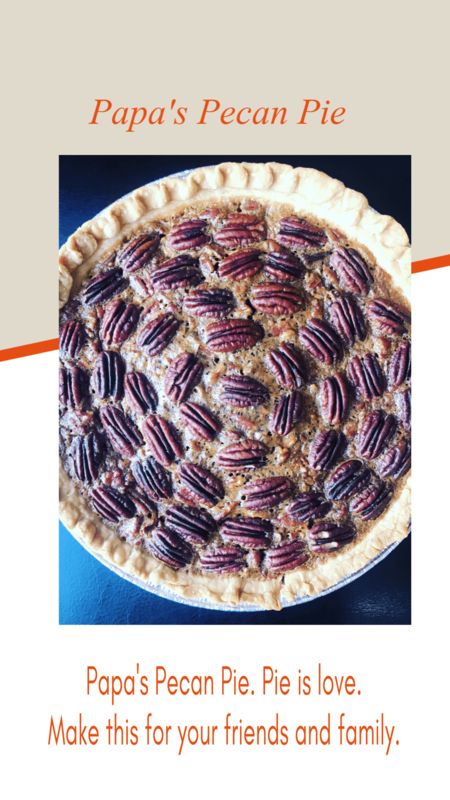 This pecan pie recipe has stood the test of time! I think you will love it.